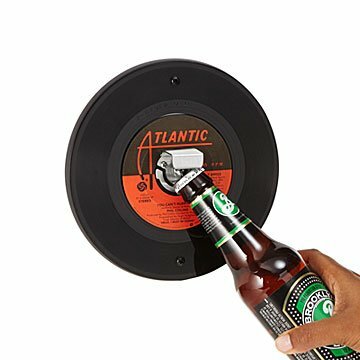 Pop open bottles with pop tunes: made from reclaimed 45's, this opener will be a #1 hit with music lovers. Groove on your favorite music genre every time you open a refreshing beverage with Jeff Davis's one-of-a-kind, wall-mounted bottle openers. He makes each one from a real vintage vinyl record in your choice of genre: rock, soul, country, or 80's (artists and songs will be random). The stainless steel bottle opener in the center looks just like a 45 rpm adapter, and the "B" side is made of sturdy fiberboard. Hang it in your hangout room, and you and your pals can bop with a brew—or some soda pop. Makes a chart-topping gift for music loving friends and family. Handmade in Philadelphia. I love the product but it only came with one screw rather than the two required to mount. This product is very well made and a cool gift! However, I would much prefer to be able to have more of a say so in what record you receive. I asked Customer Service if this was possible and was told no. I ordered one and didn't love the record, so I ordered a second one in hopes of a better record - it was the exact same record. I think more people would order if they could be a part of picking the record. Bought as gift and it was loved! Sent this to friends as a thank you gift. They LOVE it and it fits into their decor perfectly. A great gift!